T’was a month before Christmas on the pipeline, not a heart was beating not even mine. On Dasher! On Prancer (Development Deer) - QA and Security, they are all here. Red hats worn by all and only one “White”; The teams almost ready, so don’t you fright. When what to my wondering eyes should appear, a massive build from the Ops Engineer! This today, that tomorrow, “Fail Fast” and learn there is no sorrow! Ho Ho Ho! A jolly Scrum Master appears; impediments removed we all give a cheer! Ops leads the way with their nose shining bright; we are agile and fast and we’re out of site! Off with a flash, then “deer-to-deer” review”; here comes the surprise, it's coming to YOU. We stand all amazed, and straight is our gaze. The Christmas tree stands all tall and bright; its branches are massive and covered with lights! On top is a star that streams long bright bars, spreading LOVE, PEACE and JOY both near and afar! We are proud and celebrate this De Liv ere eee! We got it all done with “velocity”. Down in the meadow we see a small boy. It’s Tiny Tim with a new “user story”. The tree is amazing, but children are coming; they need some presents, so we’re off and running. No time to linger there is much to do; we’re agile and fast, and on to Sprint two! Red hats are flying and only one "White" we know we must hurry to make this all right. Now the children are happy, and they’ve come from miles; presents abound bringing their happy smiles. 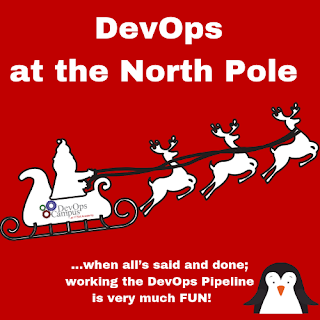 In retrospective when all’s said and done; working the DevOps Pipeline is very much FUN! Merry Christmas to all and Happy Holidays, too. We will continue to “collaborate” with YOU!